How does Copiosis deal with Criminal Justice? Every nation has laws and creates an organization or even several organizations to attempt to enforce those laws. The parts of the law that can be considered criminal law and the organizations that exist to enforce that law are considered to be the criminal justice system. The police, the courts, the prosecutors, the defense attorneys, the whole prison bureaucracy, the bail bondsmen, parole officers and on and on, all are parts of the criminal justice system. We know for sure that there is lots of crime in traditional economies such as the U.S. We have a large prison population which has a recidivism rate of perhaps 40%. So the prisons and the rest of the criminal justice system do not seem to be preventing very much crime nor reforming very many convicted criminals. We also hear of enough cases where the innocent have been convicted of crimes and sent to jail for many years to know that a substantial proportion of those in jail for crimes are innocent of the crimes for which they were convicted. Of course, given the amount of crime in society, they are probably guilty of some other crime. We have many more crimes reported to law enforcement authorities than are ever solved. We have many more crimes committed than are ever reported to the authorities. The courts are overburdened and slow. Prosecuting attorneys are rewarded for convictions, not for justice. In other words, the criminal justice system is an abysmal failure in almost every respect. It neither prevents crime nor reforms criminals and it does it all in a haphazard, unjust fashion at enormous expense. But that all can be explained by the society’s reliance our current system. Criminal justice workers are not paid to prevent crime nor to be just. How would a Copiosis criminal justice system work in comparison? First, we should remember that there is far less crime in a Copiosis society since there is far less opportunity and far fewer rewards for criminal acts. The corrupting influence of organized crime will not exist. Most of the crimes for which jail time is an appropriate response in a traditional economy will be impossible in a Copiosis one. Crime will simply be a much smaller scale problem in a Copiosis society. But when crime occurs anyone who participates in its detection and the enforcement of the law will be paid. Those who make crime more difficult will be paid. Those who prevent miscarriages of justice will be paid. Prosecuting attorneys will be paid for seeing that justice is done as opposed to being paid for convictions. Judges are paid on the basis of the consequences of their actions. Therefore justice is much more likely to be done since the prevention of injustice and the detection of injustice will be paid well. Today when a crime is committed people don’t want to get involved. In a Copiosis society people would be paid for their involvement if the consequences of that involvement were beneficial. This involvement starts with preventing crime and includes helping the victim, preserving evidence, providing honest testimony, apprehending a suspect, serving on a jury, and reforming the guilty. Notice that there is no pay for punishment. Revenge or punishment produces no benefits for anyone. Incarceration may be necessary for some violent criminals but for other crimes, there are other, much more effective sentences than jail. Judges will be paid well for handing down appropriate sentences that fit the criminal and the criminal’s situation. Judges will not be paid for sentences which are expensive and help no one. Judges will have far more latitude than do judges in a traditional economy because they have no motive to be irresponsible or corrupt. Also, they can do no harm unless others participate and others will only participate if they think that by doing so they will benefit others. Therefore, even a corrupt judge could do minimal harm. There are many cases in today’s criminal justice system in which certain organizations are underfunded. One of these is probation officers. But in a Copiosis society, there is never a shortage of money to pay for actions which produce benefit to others. So long as there is a need for probation officers, those who take up that work will be paid for the good they do. This is also true of all other aspects of the system and includes pay for equipment, offices and so forth. The level of crime will determine the resources that are devoted to dealing with it. This is because of the free market relationship between the payers and the producers of benefit. If there is little crime then there will be little benefit to be derived from dealing with it. As crime increases, the pay for those who act to reduce it increases. This attracts more resources to deal with crime. Since there is a large number of Payers and a large number of Producers (millions in each case) the market is quite free and anyone can participate however they like. Thus, the society pays the minimum (in resources) for its criminal justice system and gets the most benefit possible for the investment. 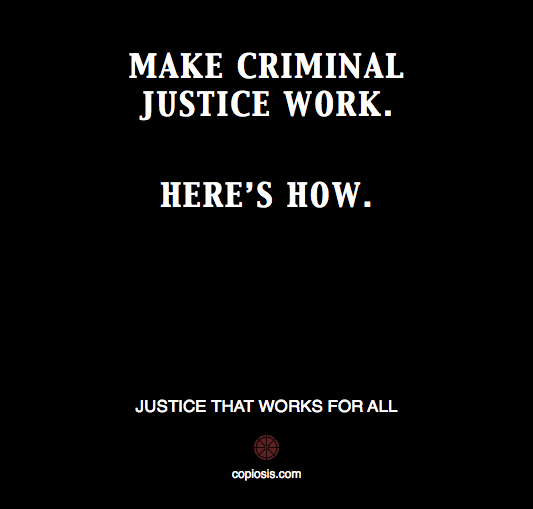 « Justice working for everyone.